Northbank skyline with EverBank Center, Jacksonville Landing in front of SunTrust Tower and Bank of America Tower, Wells Fargo Center and Main Street Bridge in Jacksonville, Florida. Satellite view showing Jacksonville, most populous city in the State of Florida in the United States. It is the largest city by area in the contiguous United States. The port city is located about 26 km (16 mi) west of the Atlantic coast, 265 km (164 mi) east of the state capital Tallahassee in the northeastern part of Florida, near the state border with Georgia, at the estuary of the St. Johns River, one of a few rivers in the United States that flows north. Downtown Jacksonville with EverBank Center, Wells Fargo Center, SunTrust Tower, Omni Jacksonville Hotel, Bank of America Tower, and 550 Water Street. Jacksonville was founded in the 1820th short after Spain ceded Florida to the United States. The town was named after after Andrew Jackson, at that time the Military Governor of Florida who later became the seventh President of the United States. Today Jacksonville is preferred called JAX. 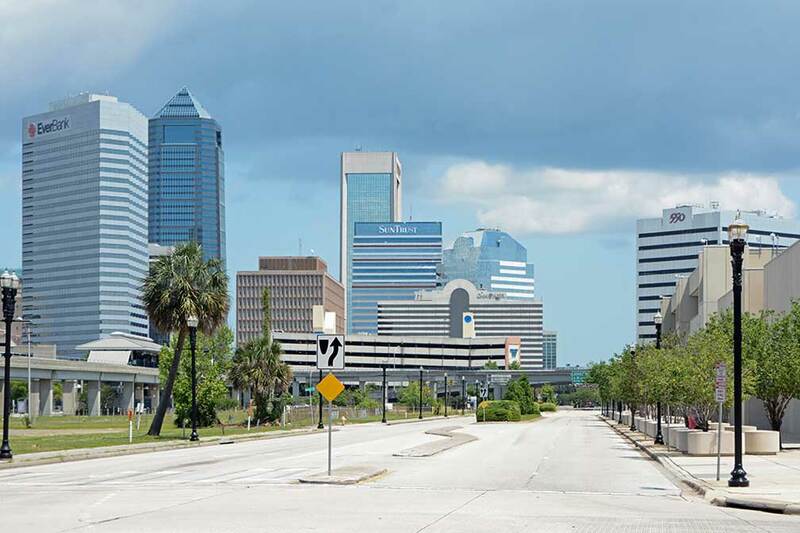 The 12th most populous city in the United States is seat of Duval County, it has a population of about 880,600 inhabitants (in 2016), 1.44 million people live in Jacksonville's metropolitan area. The city's economy is based on industry, banking, insurance, logistics, healthcare and tourism. The deep-water Port of Jacksonville (JAXPORT) with its three separate cargo facilities is the second largest handler of vehicles in the United States. The third largest military presence in the US contributes also a great deal to the city's economic activity. 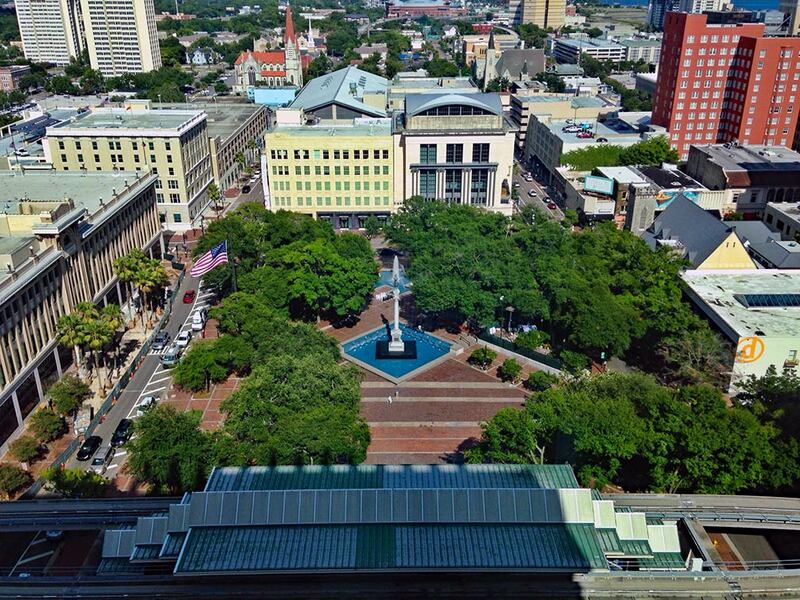 Hemming Park in Downtown Jacksonville with St. James Building (Jacksonville's City Hall) to the left. The oldest 'park' in the city is today more a brick-paved square located in the heart of the city's government center. Places: Jacksonville Riverwalk (all along St. Johns River), Kingsley Plantation (former estate with a history, at the northern tip of Fort George Island), Friendship Fountain (trick fountain and park), Fort Caroline (National memorial, remains of a short-lived French presence in sixteenth century Florida), American Beach (8.5 acre sand dune, founded in 1935 to provide African Americans with beach access), Amelia Island (known for its luxury resorts, golf courses and sandy beaches). Parks: Jacksonville has the largest urban park system in the US. Just zoom in (+) to see Jacksonville Landing, the business, cultural and entertainment center in downtown Jacksonville. The page shows a city map of Jacksonville with expressways, main roads and streets. Zoom out to see the location of Jacksonville International Airport (IATA code: JAX), about 9 mi (14 km) north of the city. Google Maps: Map of the City of Jacksonville, Florida. Largest cities in the USA. Official Travel Website for Jacksonville Florida. Springfield | Tallahassee | Tampa | Topeka | Trenton | Tucson | Washington D.C.